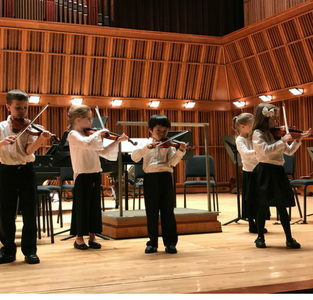 Ten local five- and six-year-olds developed their musical skills through a Suzuki-based violin class offered by East Central Indiana Youth Symphony Orchestra. A $3,000 grant from The Community Foundation allowed the class to be available and provided scholarships to students. Throughout the year, students met weekly for Suzuki class and performed in three concerts. The students in the small class quickly became friends and celebrated each other’s accomplishments and supported one another through the challenges associated with learning a new instrument. Parents watched their children build their skills and find new confidence through their music education. The Community Foundation is pleased to be a part of programs, like this one, that support arts and culture, education and quality of life in Delaware County. We continue to support this organization in 2017 with a $4,000 grant that funds a partnership project between the Youth Symphony Orchestra and Ball State University designed to give more individualized music instruction to young musicians by pairing them with BSU music education students. Quarterly Competitive Grants are funded through unrestricted gifts to The Community Foundation.